EDIT!!! -- Whilst these were "free for use" -- 600+ people downloaded them.... only 25 added them to their favs and 1 person commented.... that means A LOT have been getting off scott free! All I asked for was a simple comment/credit... but no... even that was too difficult! So now, if you want them you'll have to pay for them! Simple....! So I made these for myself as I found that every social media set I came across had some but not all of the icons that I needed. These are free for use, do with them as you wish; just credit & comment if you use them - please don't sell them! Icons included: 500px, deviantART, Facebook, Etsy, Flickr, Instagram, Join.Me, LinkedIn, LiveStream, Pinterest, Portfolio, Skype, Twitter, Tumblr, Wordpress, YouTube. Made by me; copyrighted to me. 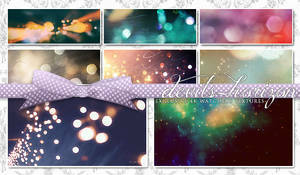 Made in Adobe Photoshop CS5. Thank you for making these! I was happy to purchase a download. Thank you so, so very much for making these! 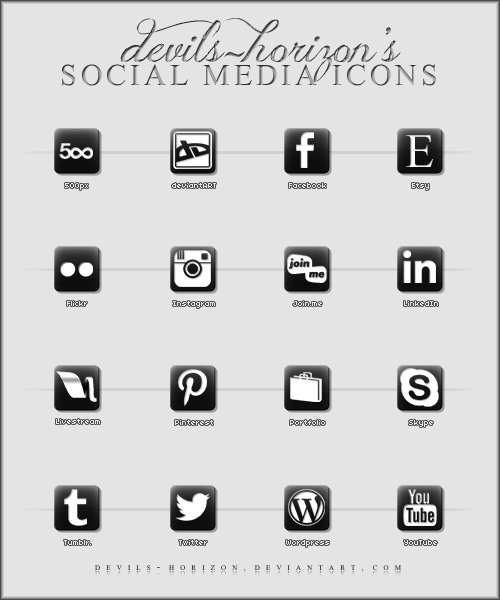 I have been looking for social media icons that aren't totally colorful -- and include all of the sites I need. You wouldn't believe how few icon sets actually have Pinterest! They must've come a long way in the last couple of years!! Thank you again!!!! thanks - I paid because they seem to be one of the nicest out there. Ooh, yes! I love that 500px is included - it's so often forgotten.